Unix versions are available as source code and packages for different flavours of Unix like Linux, FreeBSD, Mac OS X. 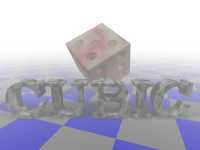 Open Cubic Player 2.6.0pre6 for DOS. Open Cubic Player 2.6.0pre6 Source. the deprecated and dead code base. Background Images for OCP. Simply copy these in your ocp directory and add their filenames to the cp.ini configuration file. original GUS MIDI patches you can use to play MIDI files. You can also use the Freepats Project patches. The modules cubical and flowers of vain contained special samples, that show a picture when displayed in a graphical spectrum analyzer. Those samples were made with the tga2wav program. The same program was also used to generate the title string of Dirk's university graduation paper. You can download the source code and a Win32 executable. The source code should compile with every C++ compiler for most platforms.